Bayanhosting.com utilizes only Dell and Supermicro servers to provide you with enterprise class servers. Our Dell and Supermicro dedicated servers are customized with server grade hardware to ensure the integrity and longevity of your hosted data. Bayanhosting.com can customize any of our servers to fit your business’ exact requirements. From budget-friendly Atom servers to our Dual Octo-Core Romley Xeon servers with 96GB RAM and hot-swap SSD drives, Bayanhosting.com always has a dedicated server solution to fit your exact needs. Bayanhosting.com is equally as flexible with its software offerings. We can provide you with any Windows operating system (OS) or several Linux OS variants. We also carry several control panels such as cPanel, Parallels Plesk Panels, DirectAdmin, WebSitePanel, Parallels Hsphere and Webmin which can all be easily added to any dedicated server order. 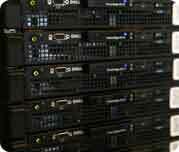 All our dedicated servers are supported 24/7/365 by our Technical Support teams. They have the experience to handle every issue that can come up with a Linux or Windows dedicated server professionally and promptly.